“Aaniin” “Boozhoo” – customers to Bem-idji’s Cabin Coffee House & Café are now welcomed in both Ojibwe and English. Table tents show them numbers, animals and the Red Lake clans in both languages. And they can try their Ojibwe language skills to order makade-mashkikiwaaboo (coffee) and naboob (soup). Noemi Aylesworth, Cabin Coffee House owner, said the idea came from Shared Vision, a Bemidji group working to make relations between American Indians and members of the majority culture more comfortable and friendly. “I thought it would be a kind gesture, and it only made sense,” Aylesworth said. She said she plans to hang a feather painted with “Ininiwag” on the men’s rest room door and with “Ikwewag” on the women’s rest room door. 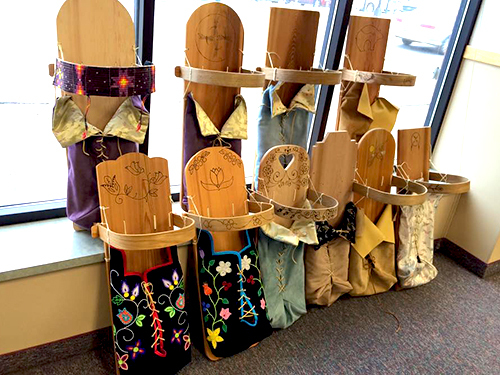 Shared Vision members Michael Meuers and Rachelle Houle set themselves a challenge to have bilingual English/Ojibwe signage in 20 Bemidji businesses within one year. But with nine additional businesses already committed to, they said they think they might meet their goal by the end of the month. He said he does a significant amount of business with the Cass Lake Indian Health Service, and he plans to put a welcome sign (“Boozhoo”) on the outside of the door and a thank-you sign (“Miigwech”) for people to see as they leave. 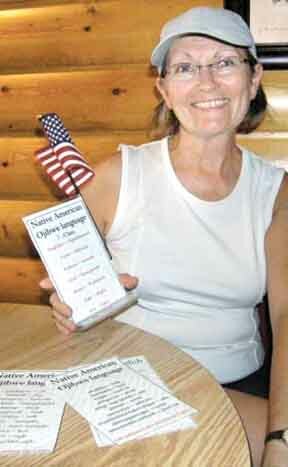 Houle said she and Meuers propose the concept to business owners with three talking points: to welcome Indian customers, to teach non-Ojibwe speaking customers a little of the language and “tourists eat it up.” Aylesworth agreed, saying customers, such as a couple from France and some people from the state of Virginia, have already asked her for copies of the Cabin’s table tents. Sandy Jo Pilgrim, owner of SJ & Company Hair Design & Day Spa, The T-Shirt Shop and My Best Friend’s Closet, said she plans to have “Boozhoo” on the door of all her businesses. “I’ve been talking to some of my clients from the reservation, because I didn’t want to do anything offensive, and they love it,” Pilgrim said.“I think it’s a great idea,” said Andy Wells, a Red Lake Nation enrolled member and a member of the Bear Clan. He said border towns such as in southern California use Spanish/English signs out of necessity. “Here, it’s done out of honor,” Wells said. 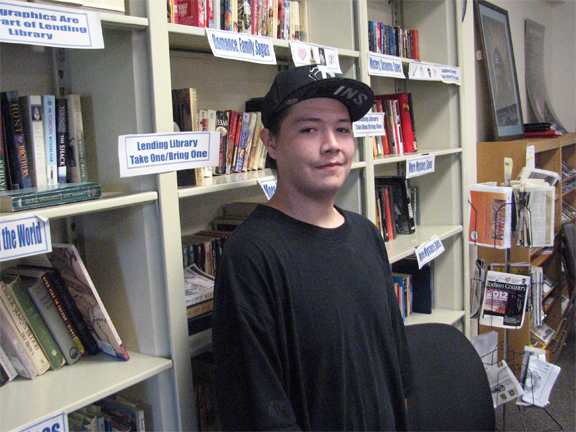 The Boys & Girls Club of the Bemidji Area also has joined the bilingual movement. Other businesses committed to Ojibwe/English signs, according to Meuers and Houle, are Dunn Bros Coffee, 4 West Office Building, Bi-County CAP, and Country Kitchen.